Springtime in the Smoky Mountains means the hour of the wildflower has arrived in Great Smoky Mountains National Park. To celebrate, thousands of people from all over the world have come to the area to join in the annual 5-day Spring Wildflower Pilgrimage, for a glimpse of magic. 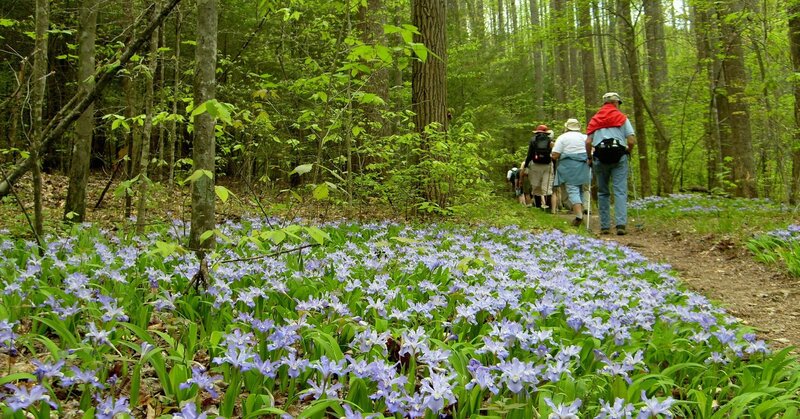 The pilgrimage is from April 19-23, and offers more than 150 different classes, talks, evening programs, guided trail hikes, walks and even motorcades to all the best places to see the most wildflowers. Most events are by registration, with a few presentations open to the general public. Local and visiting experts in a variety of fields, from photography to ecology, gather at this time to pass on some of their knowledge and skill. Many people plan a year ahead for the annual Wildflower Pilgrimage, and while there are still spaces to be had, most programs fill up very quickly. Online registration has been open since mid-February, and onsite registration will open on the first day of the event, April 19, 2016, at 5 pm in the Mills Conference Center in Gatlinburg. For full details of all the programs offered, see the Spring Wildflower Pilgrimage website, and download the full program brochure [pdf], which takes 26 pages to fit everything in! The wildflower phenomenon in spring is an unforgettable experience, and the annual Pilgrimage is a unique opportunity to learn from experts, park rangers and locals with deep knowledge of the hidden treasures easily in view, and better to appreciate, once you know what to look for. There are over 1,500 species of flowering plants in Great Smoky Mountains National Park, which is recognized as one of the world’s distinct biospheres – and which is also the only national park in the US that never charges a fee for admission. The park is widely accessible, with numerous trails and roadways. The problem is that there’s too much to see – and this is where events like the Pilgrimage are worth their weight in gold – or at least wildflowers. Millions upon millions of wildflowers bloom in spring, everywhere you turn, and especially – of course – in those places you don’t know to look. The process happens in reverse of the famous fall color change. In fall, the leaves turn first at the mountain tops, and the color change gradually rolls down slope over the weeks. In spring, the wildflowers begin to bloom first at the lower elevations, and make their way up the mountains, over a similar 4-6 week period. Right now, some of the lowest elevation wildflowers have already passed their peak, and the awakening is moving gradually upwards. We began with early daffodils in Cades Cove a few weeks ago. And by the end of April and early May, look for the numerous sighting of the brilliant mountaintop flowers. But now, as the Pilgrimage begins, expect carpets and carpets of bright and amazingly detailed artworks to cover the slopes and banks and forest floors. And the Pilgrimage will attempt to see it all. Look for the latest news and photographs on its Facebook page of the exquisite sights, unmatched anywhere, many would say. You have to admire the wildflower, which waits all year for this one window of opportunity, and then gives its all in a burst of color and natural artistry. Great Smoky Mountains National Park is a tree place, which is the first thing obvious to all, and in fact there are over 100 species of tree in the park – so many trees in fact that the moist forest floor is usually deeply shaded by abundant leaf coverage. Except in spring, when the trees are still leafing out, and the wildflowers seize their chance.